Please pray for some new opportunities to open up two new schools for Student Venture ~ at a new Omaha school, and also at a Lincoln school. We were recently invited to the Accelere alternative school in north Omaha to share with the principal and a teacher there about Student Venture. They are each dynamic Christians and have a deep passion to help these 17-20 year old students not only get their diplomas, but also learn to know and follow Christ. As a result of our visit, we have been invited to start SV during the school day at their school. This is a great opportunity! Please pray for us to secure the personnel and resources we need to make this happen. In addition, we also have a new opportunity to start Student Venture at Schoo Middle School in Lincoln. A Campus Crusade (Cru) Campus Ministry staff family there has sensed a call from God to make this happen in their neighborhood. We are thrilled that God is opening this door. Not only is this a new open door where many students need to hear about Christ, but it is a new opportunity to partner with Campus Ministry staff as we follow God's call to fulfill the Great Commission with today's youth. Students from our area who went to the SV FastBreak conference in the Twin Cities between Christmas and New Years, shared their experiences with their peers back home at their next SV meetings. The top two photos show the meeting at South High School in Omaha, and the lower two photos were taken at the Fort Calhoun SV meeting. Blair High SV students also shared at their next meeting, but we don't have photos to show. At South High in Omaha (above), Shayn shared about how we all went to the Mall of America during FastBreak and took the initiative to get into spiritual conversations with shoppers. He said that was a highlight for him, and taught him that he could do that with his peers at South. Josh from Fort Calhoun SV (below) shared things he learned from various speakers and then provided questions for small group discussion of what he learned. 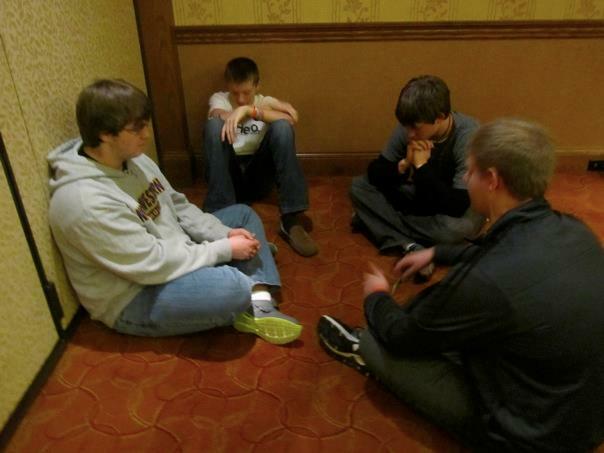 "I really honestly felt small groups went well this year. The group was very open and honest throughout the whole experience, and I really felt great progress was made spiritually for the students this week. There were real walls being broken down. I also know that the Blair and Fort Calhoun guys were talking about starting some sort of accountability group because of the week, so that may end up being really awesome, too. I think the most important thing we talked about this week was really being bold and courageous and I think that these guys will really achieve that." The Twin Cities, MN, is where two of our staff team, two of our college volunteers, and 13 students from our area were from Dec. 28 through January 1st. Every year between Christmas and Yew Years we take students to a regional Student Venture FastBreak Conference in the Twin Cities. 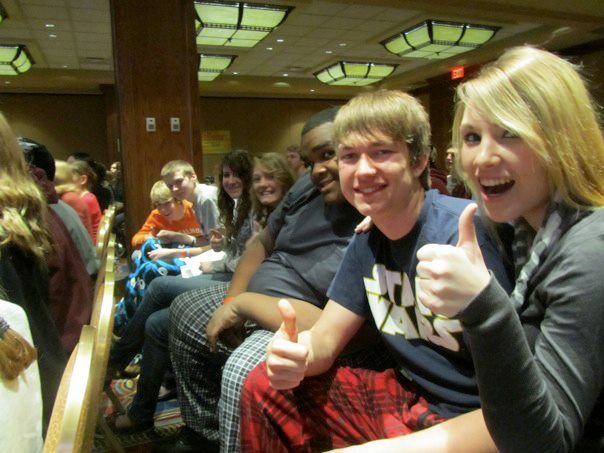 This year we had students attending from four area schools: Fort Calhoun, Blair, Omaha South, and Omaha Street School. 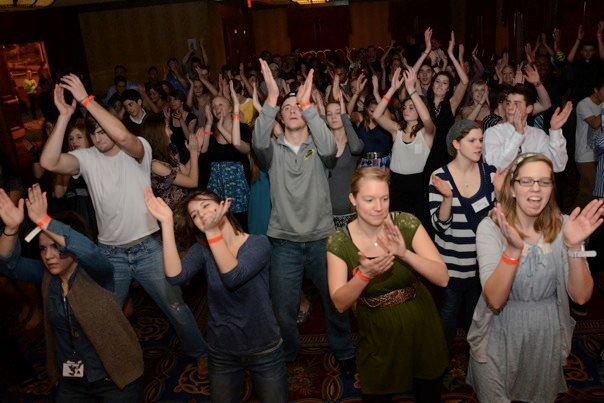 The students were involved in various worship times, training seminars, and had the opportunity to hear great speakers in the main sessions. The theme of the conference was FUSED (as in abiding in Christ from John 15). 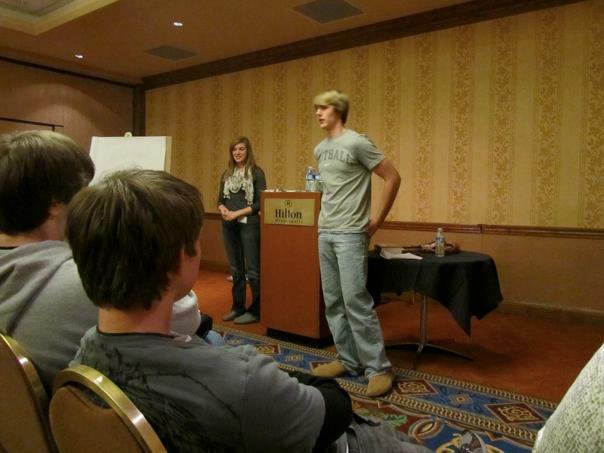 One of our high school student leaders co-led one of the seminars together with a student leader from the Twin Cities. Josh and Abby led the students deeper into understanding the power of God through prayer, and the great resource we have in communicating with God. 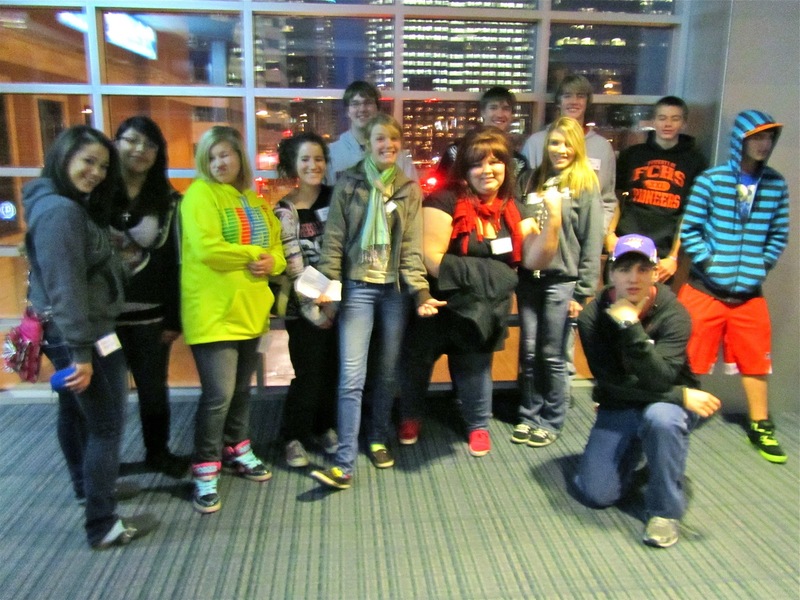 Our students participated in a day of outreach, where they put into practice some of the things they learned. 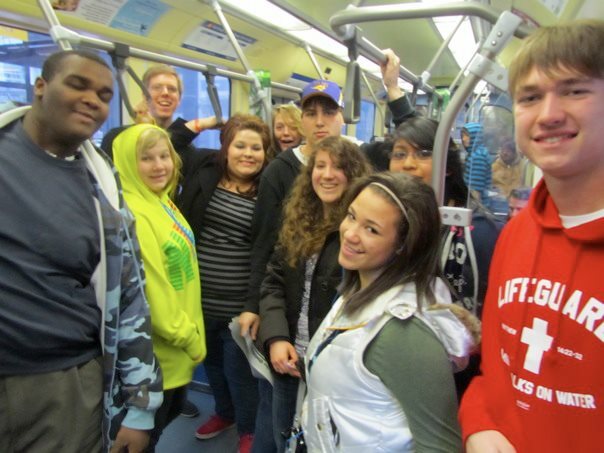 In the photo below, they are on their way to the Mall of America, where they initiated spiritual conversations with shoppers at the Mall of America. One of our students from Omaha South High shared later that this time was a highlight for him, and gave him courage and desire to share of his faith with his peers back at his high school. 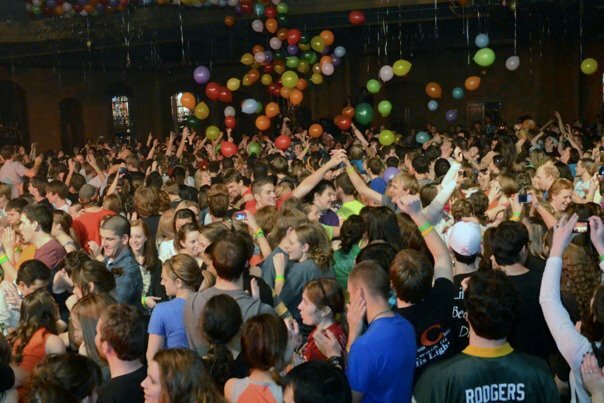 New Year's Eve was a highlight, as the one hundred and thirty high school FastBreak students joined with TCX, the college conference going on at the same time as FastBreak, for a big New Year's Celebration. 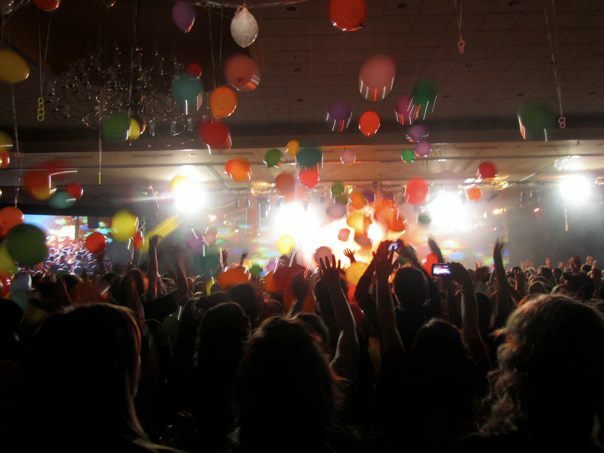 They welcomed the New Year in with a time of worship and prayer, followed by balloons and celebration. 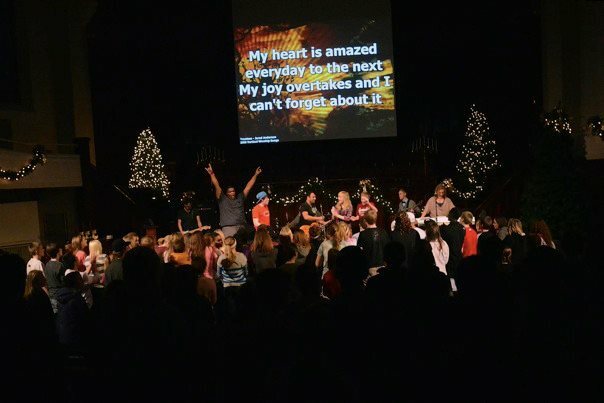 Thanking God for all that He did in the hearts of students during FastBreak. Please pray for each of them as they have returned to their homes and their schools, that they will continue to be impacted in deep ways with God's love and His truth, and that they will make a difference for eternity on their campuses. Our SV group at Omaha South participates in various serving projects during the school year, and one of these projects was mentioned in the Omaha World Herald newspaper! 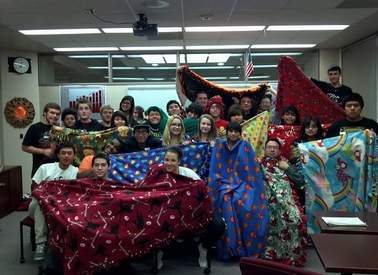 "Omaha South's Student Venture club tied fleece blankets. Some were donated to a family in need, and others were given to the Stephen Center, a shelter." 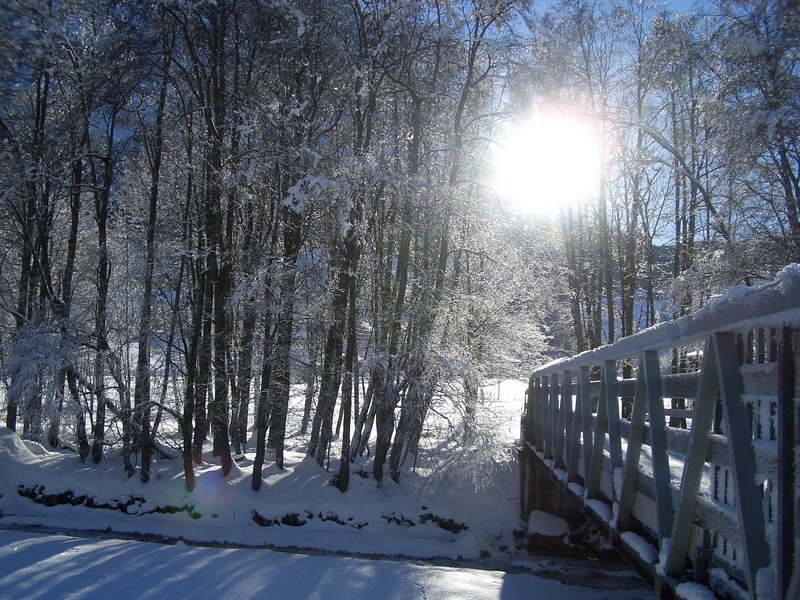 A new year brings new opportunities, and also brings changes. And one of these changes for us is that we are needing to make a transition (again) with our website. 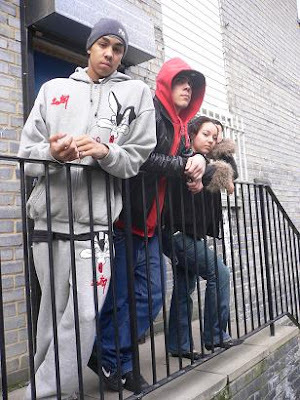 As our website location will be closing down in a few months, we are choosing to transition now, at the start of 2012, to this new blogspot location. You may view our past posts at our website by clicking here. After June 2012 this site will no longer be available to us. All of our entries from January 2012 and on will be here at this location. You are also invited to visit Cherry's blogspot for family news, as well as posts of interest to women - click here.